The complaint alleges that Anne Kirkpatrick made at least three false claims about an August immigration raid. Oakland Police Chief Anne Kirkpatrick. 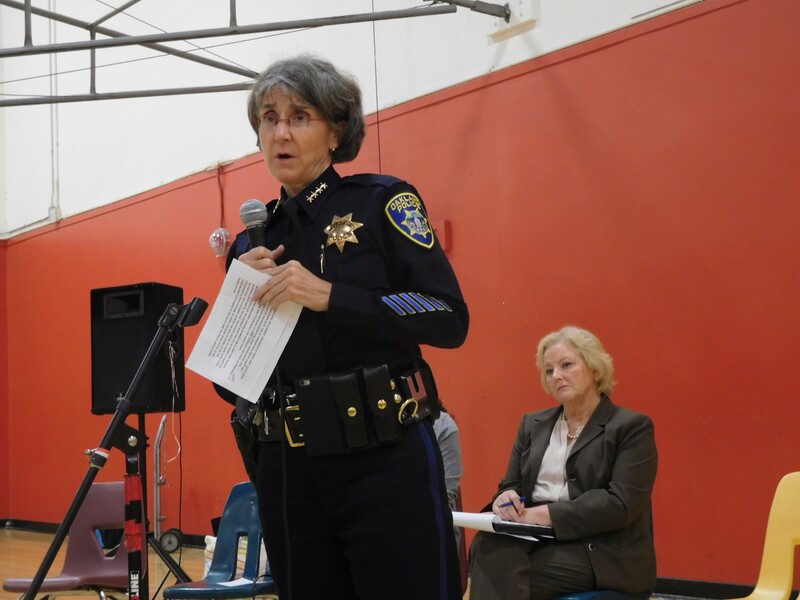 Eight Oakland residents, including Brian Hofer, chair of the city's privacy advisory commission, filed a complaint against Police Chief Anne Kirkpatrick on Monday for allegedly making false statements. The complaint, lodged with the Citizens Police Review Board, alleges that Kirkpatrick made at least three false statements about an Immigration and Customs Enforcement operation that involved the search of a West Oakland residence on Aug. 16. At least two Oakland police officers assisted ICE during the raid by blocking off the street to through traffic. Kirkpatrick defended her decision to help ICE because the agency told her, she has said on several previous occasions, that they were carrying out a criminal search and arrest warrant related to a human trafficking case. A man named Santos de Leon was arrested by ICE agents during the operation, but federal records show he has not been charged with any crime. However, on Sept. 6, Kirkpatrick told the public that he had been charged with a crime. Kirkpatrick also stated there was no deportation matter in the case. But records obtained by the city's Privacy Advisory Commission revealed that de Leon is now facing a civil deportation case. Immigration court filings prepared by U.S. Department of Homeland Security attorneys furthermore show that there isn't evidence that de Leon was involved in any crime. Under Oakland's sanctuary policy, the police are not supposed to assist ICE in enforcing civil immigration laws. It's not clear whether ICE officials misled Kirkpatrick or if she lied about the circumstances involving de Leon's arrest. The complaint against Kirkpatrick also alleges that she made false statements about the timing related to OPD's termination of an agreement with ICE. In July, the Oakland City Council voted unanimously to terminate an agreement that allowed OPD officers to work in task forces with ICE. Kirkpatrick and the department claimed the agreement with ICE was ended before the Aug. 16 ICE raid. But city records show that Kirkpatrick and ICE officials didn't actually terminate the agreement until Sept. 25. Kirkpatrick didn't respond to a request for comment, and an email to her was returned with the message that she will be out of the office until Nov. 13. Hofer and the other city residents filed the complaint against Kirkpatrick with the CPRB because the city's new citizens' police review commission is not up and running yet. The new commission has the power to fire the police chief, while the CPRB can only recommend discipline to the city administrator. A separate hearing about OPD's assistance to ICE during the ICE raid is scheduled for Nov. 14 before the council's Public Safety committee. ICE Special Agent in Charge for San Francisco Ryan Spradlin has come to the chief's defense. In a statement issued last month, Spradlin said, "Chief Kirkpatrick has been truthful in her statements about the nature of the ongoing Homeland Security Investigation (HSI) investigation and OPD’s involvement." Spradlin declined to provide further information about the case, and several attempts by the Express to obtain a copy of the warrant that was served have been denied by ICE.